Regardless of how great the show, being stuck in bad seat can make the evening a misery. Here are some tips about getting the best seat at your next event. What kind of show is it? A concert, musical, ballet, mime or a play? Big musical shows benefit from sitting up higher so you can see the whole stage. Plays are usually better viewed closer to the stage so that you can see the actor’s expressions. How big is the venue? Being positioned at the back of arena seating would not be desirable but in a small theatre it will probably not matter as much. What do you want to spend? Use the price to help decide the location of your seats. Choose the price you are willing to spend and then try and work out the best seat in that bracket. Very often certain seats offer very similar views but are priced very differently so it is worth asking the box office for advice. Before making a booking any seated event always make sure to check the seating plan first. If you end up with seats offering an impaired view, insufficient legroom or only a distant view of the stage, for example, then it could ruin the whole entertainment. When buying your tickets in person ask to see your seats on the seating plan. If you are booking over the phone or on the internet then check the venue website - most reputable establishments will now provide a detailed online seating diagram. This is especially important with older venues. Most London theatres were built in the late 19th and 20th century and generally catered for a smaller and less well-fed populace, and therefore are not always suited to modern audiences. With new theatres, worries about restricted views and tight legroom have usually been eliminated, and bolster claims that there isn’t bad seat in the house. If you are worried about your comfort then it is perhaps to go to a modern venue. Nevertheless, every seat is different, and there will always be some that are better than others. The lack of consideration by venue designers for legroom is a constant source of irritation for the taller members of the audience, with the older venues offering a particularly painful experience. When choosing seats, try to go for those by the gangway at the ends of the rows or those at the front of a section, where are no seats in front - alternatively, if you at a theatre then why not choose one of the boxes? Unfortunately some of these options will be a case of sacrificing view for comfort. It is popular myth that the nearer to the front you are the better the seat. Some theatres are in fact like modern multiplex cinemas in that some of the worst seating is to be found right at the front. You may be close to the action but you might leave the theatre nursing a sore neck, with having to crane it to see over the rim of the stage. Also if the performance features a live band or orchestra accompaniment then the people at the front nearest to the musicians pit can find their view and hearing seriously impaired. Although it can vary depending on how big or small a show is, traditionally the best seats are those where you can see all the action unfolding on stage, where the sound is well balanced and where you are close enough to appreciate the intimacy and atmosphere of a performance. 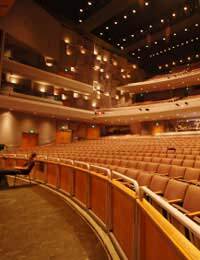 These seats are normally situated central to the performance, and raised slightly above the action on stage. If you are about to book seats for a show and are unfamiliar with the venue, then it is always worth researching the comments of those that have been before you. The www.theatremonkey.com website provides detailed comments about the best and worst seats in many of London theatres. It includes extensive comments by theatre goers about their experiences with getting cramp seats, back pain, pressure sore and obscured views, as well as recommendations on some of the choicier seats. Ultimately, whatever seat preferences you might have, if you are not quick to book then you may find that you have no choice and are forced into a cramped corner seat at the back of the venue. Therefore the best advice on getting the best seats is to book as early as possible.